I prefer using a sewing machine for sewing. Let's face it - the stitches just come out better that way for me. But there is something so peaceful about hand stitching, and you can do it on the train or bus (unless there's a crazy driver - you might stab yourself with a needle if so). 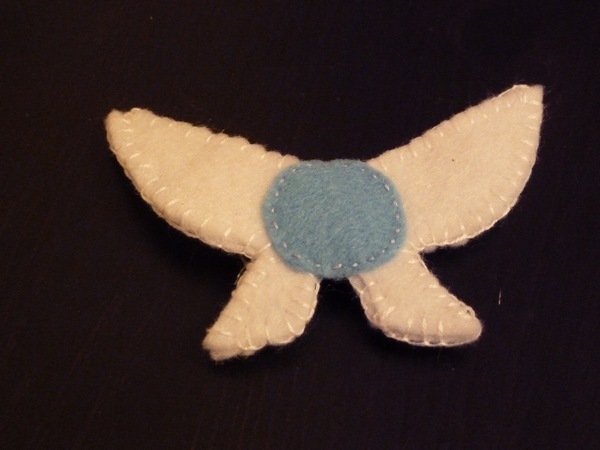 Let's give my nemesis, cheap-felt, another try, minus the hot glue and plus the hand-stitchery. 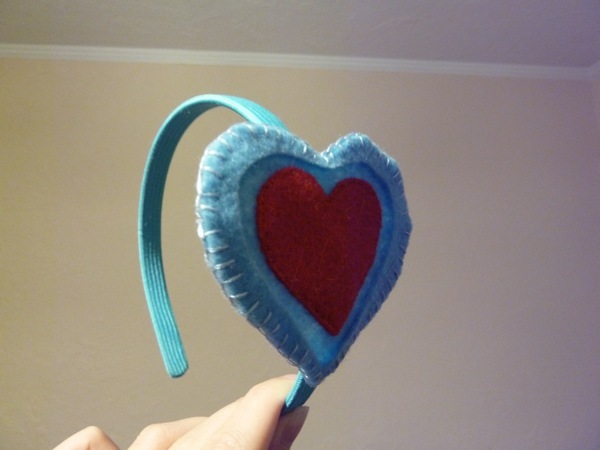 Though my blue wasn't quite light enough, the goal was to make a Zelda style heart container. 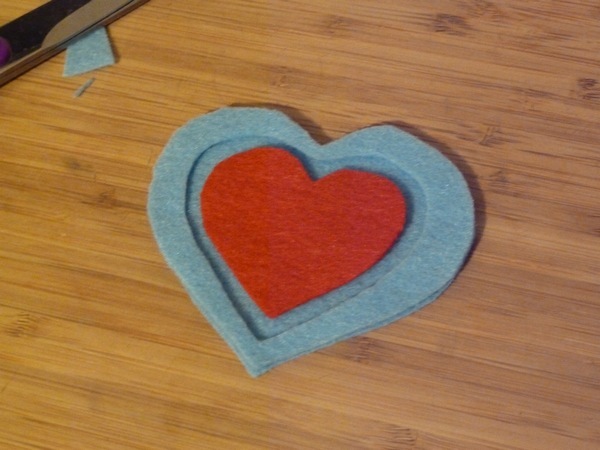 I cut out one red heart and two slightly larger blue hearts. 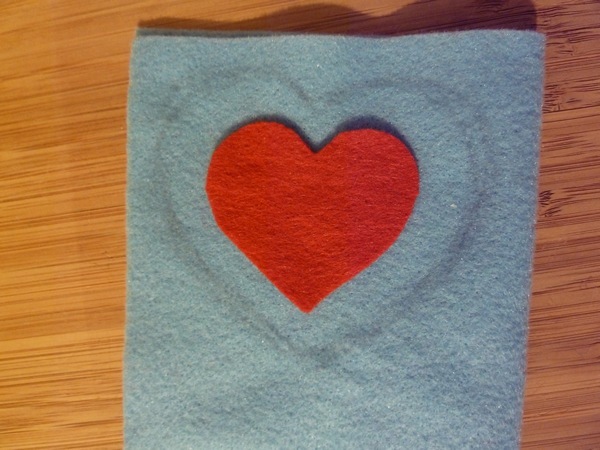 Then took one of the blue hearts and cut out the middle to make a border for depth. 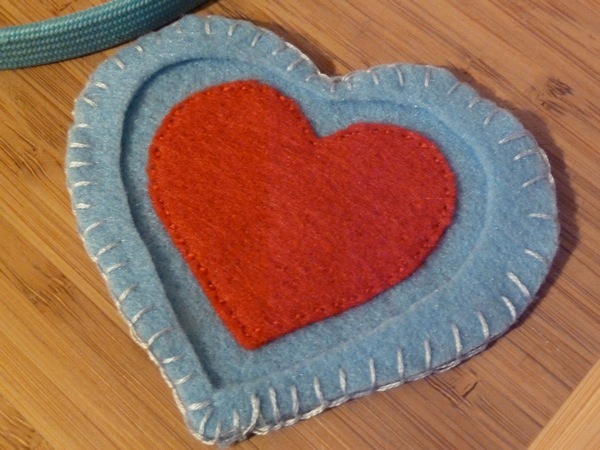 I used a blanket stitch around the blue heart. 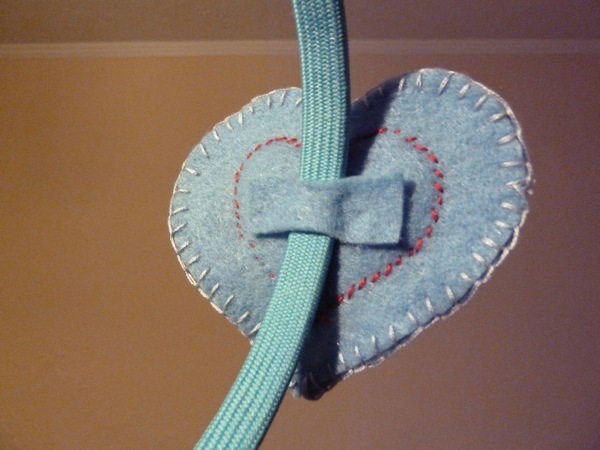 Blanket stitch is a lot of fun! You can find a good tutorial here. 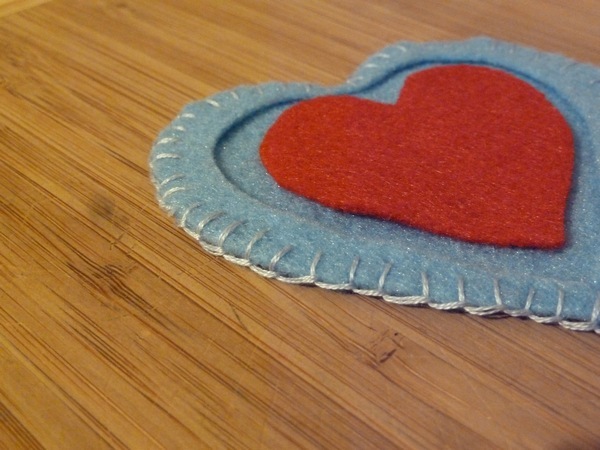 Lastly, I used a simple straight stitch to sew the red heart in place. 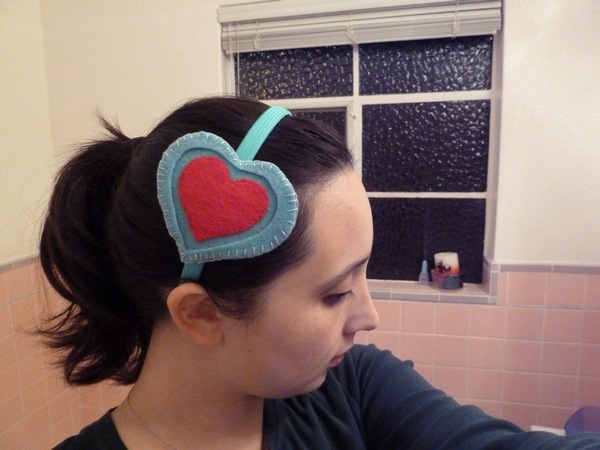 On the back I hot-glued a small piece of felt so that I could slip the heart onto a headband! Please excuse the bathroom picture. I craft late at night and it has the best lighting. :( Toliet drops in the background! Haha! The next day I made one with Navi the annoying fairy! I like the Navi fairy better I think. The best part about this is you can slip the felty off the headband and interchange them as much as you want! I got that idea from Cousin T when she made me a steampunk headband, so clever! 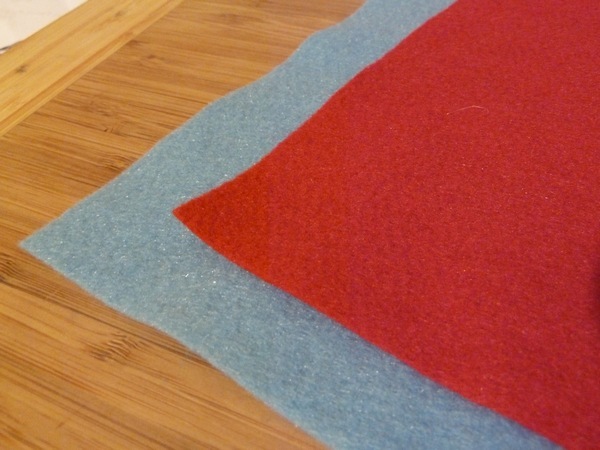 With felt so cheap and the blanket stitch so fun to do, I think we should make more fun felty headbands! For Valentine's day maybe? We can wear them to the grocery store on weekends or something, haha! You are so adorable! I've been on a headband binge lately, too. But I just weave ribbon ones, I'm too scared to sew them! That's really cute!! I like the Navi one better, too, just my opinion, but the hearts are so cute for Valentine's day, too! You can do shamrocks for March, bunnies for April... super fun! 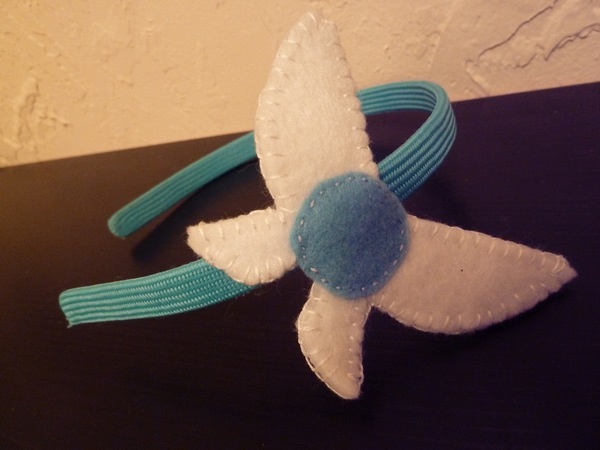 It would even be a cute idea for an Etsy item, like a headband with a different attachment for every month. For kids or adults! You're so cute! Your crafts are so cute! You really make me want to get a sewing machine and make something. way too cute! love them--you look adorable. 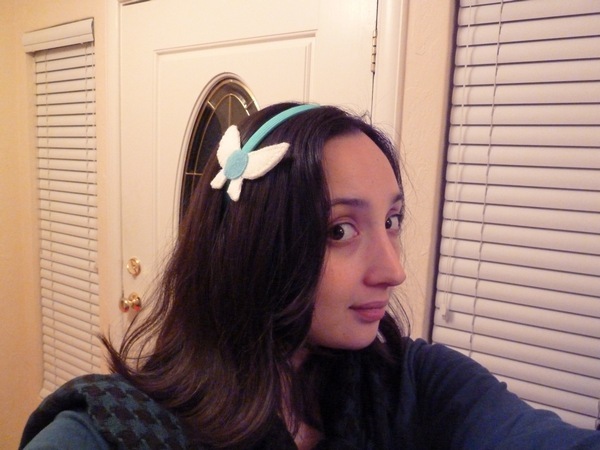 Why have I never thought of interchangeable headbands before? I make silly headbands all the time and I'm so sick of making runs to the dollar store for more! Thanks for the idea!